From high quality apartments to low cost housing, we undertake the full range of housing developments. Modern designs seek to make properties as individual as possible which requires varying floor plate shapes. This makes the integration of the services and structure more complex and calls for good team work and careful co-ordination. The Phillimore Hill (West London Project), known as The Phillimores, is a development of 74 high quality residential apartments in an existing 1914 campus building in Kensington for Westcity Wates and Northacre. The construction value was in the region of £50m and the project involved demolition, retained facades, deep underpinning, basement excavation and new construction. 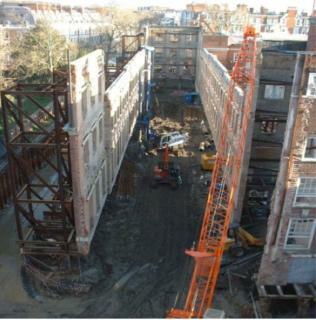 HPM were responsible for all of the structural design including the preliminary design of the temporary works.